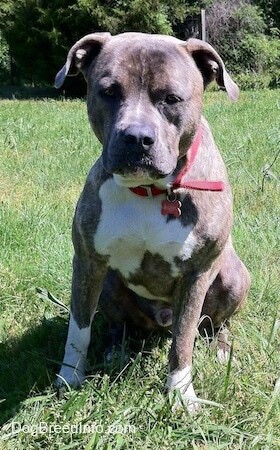 A day in the life with Spencer the American Pit Bull Terrier. 1 year 2 months, 79 pounds, 22 1/2 inches from the ground to the highest point of the shoulders (the withers). 1 year, 2 months old (14 months old). Spencer PLEASE, PLEASE, PLEASE stop rolling on top of that dead fox! I don't think I will ever understand your thrill in spreading that scent all over your body! We pretty much mastered the ability to walk by other dogs that are out walking their owners and are barking, growling and carrying on. 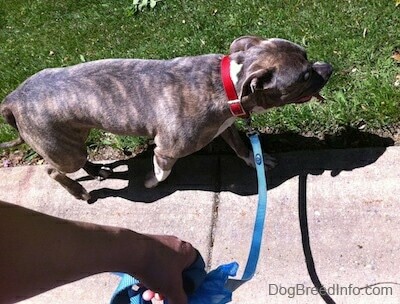 Often times the other owner will stop and move their dogs to the side trying to control them, as the Pitbull walks by with hardly a glance in their direction. One small sound from me, "sshhhhh" and Spencer faces front. The other owners sometimes ask why it is that their dog is acting out and Spencer is not. Both dogs are out on a walk, both dogs are getting exercised. 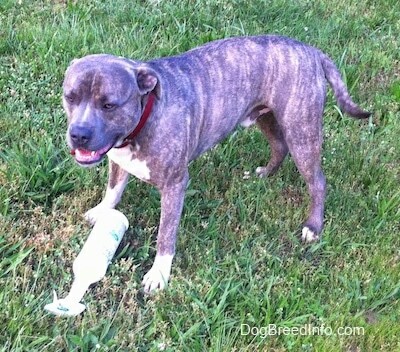 What makes Spencer, who is a Pitbull, behave better than most other dogs? 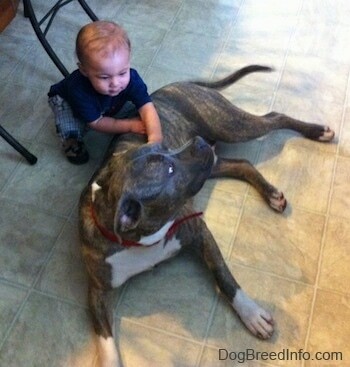 No, it's not the breed. It's never the breed. The difference is Spencer is heeling and therefore does not have the mentality in his head that he gets to make the decisions. We often take Spencer for a five-mile walk around a state park where we pass lots of other dogs and their owners. There is a pattern to which dogs act out and which ones can pass with no problems. The dogs that are heeling overwhelmingly behave better than those that are leading their humans. When a dog is leading the way, the dog has the sense that it gets to make the calls. 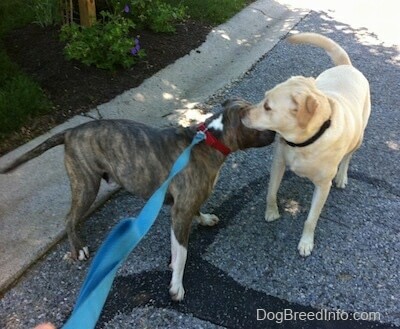 It should be no big surprise when a dog is allowed to lead the way on a walk that it will be harder to get the dog to act in a civil manner when passing other dogs. Dogs do not listen to followers. When a dog is heeling, however the dog's mentality is to follow. Therefore when the owner is able to pass a dog without acting out, the dog is more likely to mimic the owner; if the human leader does not feel threatened, than everything must be OK. When the owner communicates to the dog that they do not agree with it paying any mind to the other dog, the heeling dog is more likely to listen. 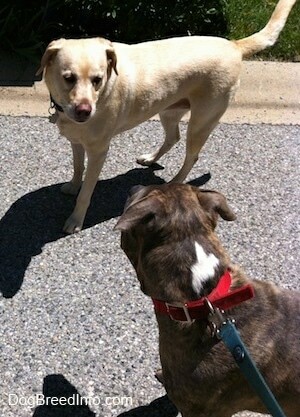 When another dog runs up to him and is non-aggressive there are no issues whatsoever. 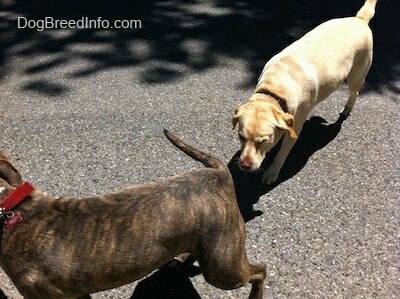 The other dog will sniff him and usually just walk away. The following pictures are of a yellow Lab that followed us down the street for a while. The dog ran up behind Spencer and smelled him. Spencer turned around and looked. Spencer decided he wanted to play with the Lab. You silly puppy, you are on a leash and I can't let you off the lead right here. Let’s look around and try and find this Lab's owner. 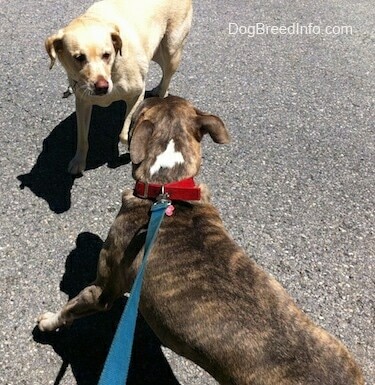 Both dogs had a submissive posture, but were still curious about one another. Then the Lab just walked away. I spotted the owners calling him. Spencer even does well when off-leash dogs run up growling at him. Just in the past week we had, on separate occasions, a Chihuahua and later another yellow Lab (this one not so friendly) run up to him growling. 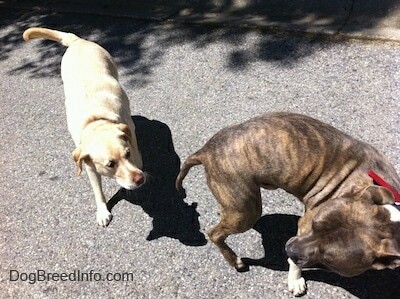 Neither dog was on a leash and both dogs tried to provoke a fight. The Chihuahua had run down his driveway, growling and barking. He ran right up to Spencer from behind and charged at him. Spencer had scooted forward when the little dog touched his leg but he did not retaliate. I saw the owner coming for their dog and had kept Spencer walking, avoiding the two of them making eye contact. The little dog's owner came and swooped him up commenting on how brave his little dog was. The yellow Lab was a little more eventful. There was a guy out mowing his lawn. He had his dog out in the yard with him roaming free. 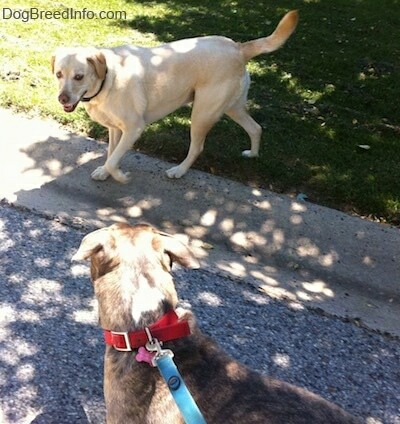 As I saw the dog approaching, I kept Spencer walking forward. The dog's hair was up, its tail was set very high up over its back and it was growling in a very dominant manner. 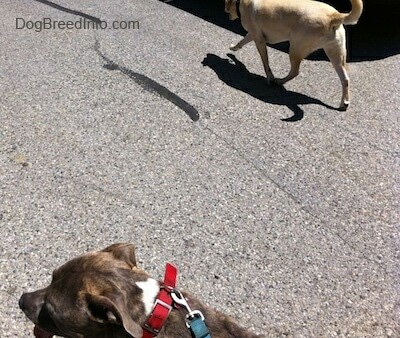 As we kept walking the Lab started to attack from behind, putting his body over Spencer's back. Without thinking I turned toward the Lab and said in a growling tone of voice, "Get off my dog! Grrrrrrrr.....", images of the pepper spray I was carrying in my pocket in mind. I moved toward the dog, the dog’s owner was also on his way. He was calling the dog back to him. Between me moving toward the dog in my mamma-bear mode and the owner of the dog not being too happy with his dog’s actions and coming after him, the dog turned away, lowered the tail between his legs with his hair still up, and went back to his yard. I am sure my response was not the safest way to handle a dog attack, but honestly I had not taken time to think about it before adrenaline kicked in. As soon as the dog was clearly in the yard and the owner was close enough that I was confident the dog was not going to make another sneak attack I turned forward and started walking again. 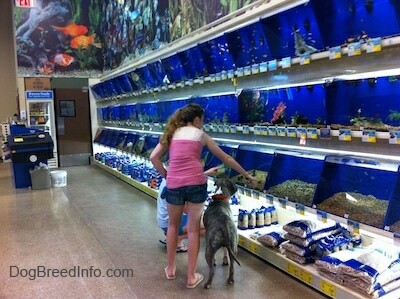 During all of this Spencer was still on his leash and had not reacted to the dog, not even a growl from him. When we turned to walk away Spencer didn't even look back, he just followed me and did not look upset or distraught by any of it. It was over and his leader handled the situation. I believe in order to keep Spencer from responding to aggressive dogs I need to show him I have the situation under control. Apparently he does have faith in me as he did nothing to retaliate. 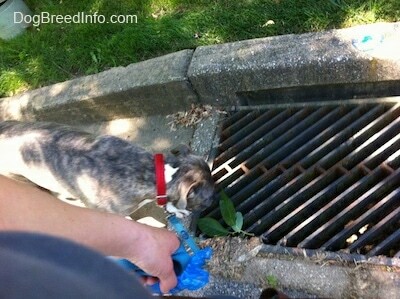 …by walking around them either on the street side or he jumps up on the curb. Spencer found an empty bottle of horsefly spray in the yard, picked it up and started to run with it as if it was his toy. Ah, no I don't think so, pup. Give me that. It can't be good for you to chew on that. Getting to see fish this close at his own eye level makes for one curious Spencer-Puppy. 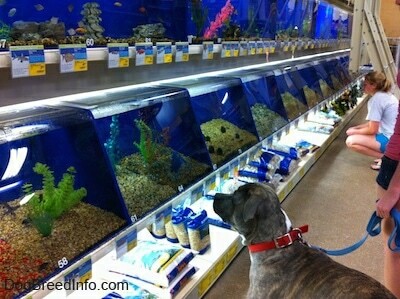 He stared at them, watching them swim around the tank. He was a good boy, though. He only looked and never tried to go for them. 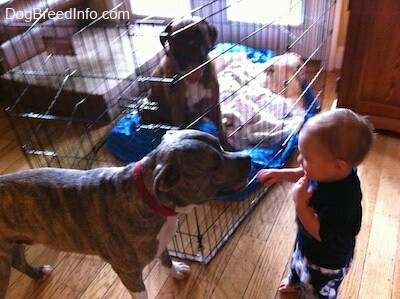 Spencer the 14-month-old American Pit Bull Terrier meets a 14-month-old baby for the first time. Spencer has seen babies from a distance but this was the first time he had one this up-close and personal. When the baby first showed up he had done his happy dance and rudely started to lick the baby all over. Right from the start we set the boundaries with Spencer: be calm and no licking or being too pushy. Respect the baby's space. Spencer gave some tongue flicks at us at times because what he really wanted to do was to lick that baby’s face up, but we told him he must not be so pushy. That was a challenge for him. 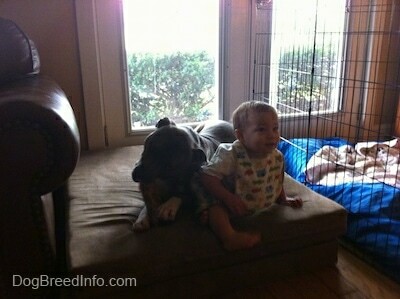 Once we set the boundaries it was as if Spencer the Pit Bull grew up with babies all his life. He was excellent. 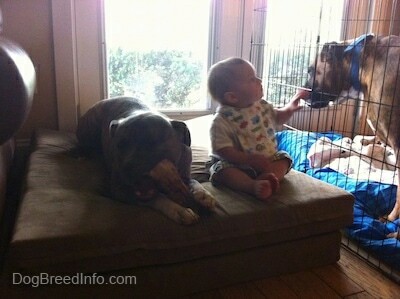 Bruno the Boxer was still recovering from his ACL surgery so he was restricted to his x-pen, but he loved the baby too. When the baby comes over Spencer starts to wag his tail. He remained lying down and stayed calm while the baby patted his back. Spencer likes to lick faces, but we set a boundary with Spencer: no nosing into the baby's face. Give him some respect. Bruno was not able to come out of his x-pen due to his recent TPLO surgery for his torn ACL but it didn't stop him from saying "Hi" to the baby. Good boy, Bruno. 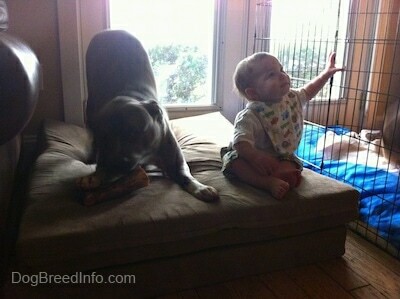 Spencer shares his bed with the baby and continues to chew his bone as the baby sits with him. Spencer was happy to have company. His tail kept wagging and he looked at the baby with playful eyes. The baby could have done anything to him. He just lay there content to be with a little person. Sara plays pool games with Spencer to encourage him to like playing in the pool and to challenge his mind. She drops food in the pool and tells him to wait and then get it. Spencer has to put his nose into the pool and bob for the food. He instinctually blows air out of his nose as he puts his head in the water.